With a wave of cuts on the horizon it is now or never for the former UConn stars who are fighting to make it onto the regular-season roster. 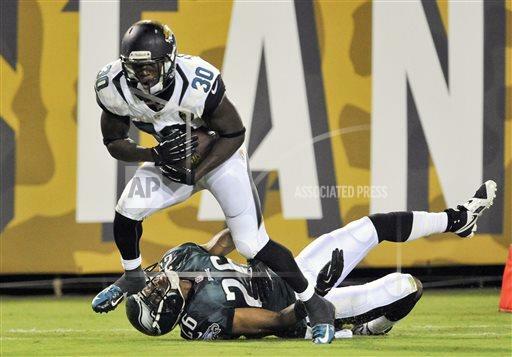 Running back Jordan Todman continues to make a statement that he belongs by ripping off a scintillating 63-yard TD run as part of an eight-carry, 105-yard rushing performance in the Jaguars' 31-24 loss to Philadelphia. With injuries limiting the preseason work of the Jaguars' top running backs, Todman has had plenty of chances to show what he is capable of and he is making the best of his situation. He is currently ranks third with 163 rushing yards in the preseason. In the same game rookie cornerback Dwayne Gratz intercepted his second pass of the preseason which ties him with three other players for the preseason lead. Danny Lansanah had three tackles in the New York Jets' 24-21 overtime win over the New York Giants. Nick Williams had two catches for 19 yards during the final scoring drive in Washington's 30-7 win over Buffalo. Blidi Wreh-Wilson had a tackle and pass breakup in Tennessee's 27-16 win over Atlanta. Robert McClain had solo tackles for the Falcons. Kendall Reyes had a pair of solo tackles in San Diego's 24-7 win over Arizona. Four more former Huskies could be in action when New Orleans plays Houston as Lawrence Wilson is a linebacker with the Saints and linebacker Trevardo Williams, tight end Ryan Griffin and receiver Michael Smith play for the Texans. Also, up North former UConn TE John Delahunt had one catch for 18 yards as the CFL's Hamilton Tiger-Cats defeated Winnipeg 37-14. Thanks for all the updates, Jim.